I have to admit, I did not read this book at Christmas-time. I read it after. And I loved it! 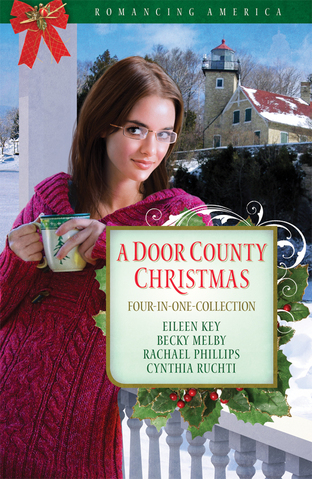 A Door County Christmas is a compilation project that highlights the work of four authors: Eileen Key, Becky Melby, Rachael Phillips and Cynthia Ruchti. The cool thing is that while these four stories are all stand-alones, they all share a common link to an eccentric innkeeper, Lola Peterson, who has gifted someone in each with a Christmas Cactus that will bloom when love does. Not all of Lola’s targets for “happily-ever-after” are fully on board or even really care if love, or a cactus, blooms. Cynthia Ruchti’s tale The Heart’s Harbor involves a young woman, Amanda, seeking a brief respite from her life and failed romance. Unsuspecting of Lola’s intentions, Amanda, who starts out as a guest, is quickly left to manage the inn. With the help of Lola’s son, Jordon, together they face a series of challenges as they gear up for the annual and much anticipated Christmas Tea. Will love bloom by then? It’s a spritely adventure and one I thoroughly enjoyed. Rachael Phillips story Ride with Me into Christmas takes a look at a widow, Joanna, as she struggles to not only keep the cactus alive, but to deal with her new neighbor (also a widower). Eventually a mutual love of bicycling bring the two together, in spite of opposition. Will they be together come tea time? It’s a sweet story of love between 50-somethings – and utterly delightful. Eileen Key tells a unique tale in My Heart Be Still with a look at the enduring love of two octogenarians and their own matchmaking efforts even when their home might be sold out from underneath them by the closest kin, a greedy woman who desperately wants the house gone. What will this spunky older couple do to keep their home and perhaps develop a more friendly family? A sweet and at times, silly, story. The final novella, by author Becky Melby is Christmas Crazy and involves an interesting mystery man, a rundown theater company, and Jillian, who is somehow supposed to pull everything together for a glorious rebirth. Can she trust dark Latin eyes and do the job? Will love bloom in her heart? A delightful grouping of stories against the glistening backdrop of Door County, Wisconsin, one of the State’s most coveted get-a-way locations. If you can’t make the trip in reality, then enjoy it here. You’ll be glad you did.